Flashback to 2014 and the finishing line of the Harrogate leg of the Tour de France on Parliament Street/West Park. 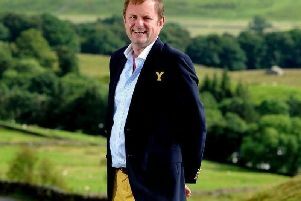 A Harrogate business leader is urging the town not to be scared of the opportunities up for grabs when it hosts the biggest international event in its history. As Harrogate gets to grips with the concept of welcoming the world’s greatest cyclists for nine days, president of Harrogate and District Chamber of Commerce, Steve Scarre said he understood people’s concerns. But, he added, Harrogate’s role as the official host town for the UCI World Road Championships would offer businesses a golden opportunity. Steve Scarre said: “To attract the UCI, not just to Britain but to Harrogate, is a massive achievement. Some town centre traders in the past have complained that other major events such as the Tour de France brought little economic benefit to them, partly because of road closures to enable the events to take place. Why cycle path has become "Harrogate's Brexit"
The chamber of commerce argues the arrival of the ‘Olympics of cycling’ represents a much bigger opportunity with more people staying for a longer time. But it is calling for improved signage this time to ensure road closures have as little impact as possible. e town centre and how that will affect trade. “We must get this signage right this time, not like in 2014, when the signage read something like “town centre closed”, when it should have said only specific roads were closed. Running from September 21-29 and finishing every day in Harrogate town centre, the UCI championships are being funded largely, though not entirely, by central government to the tune of £24 million. Not only will the event the world’s top cyclists and thousands of fans, each of the competing nations is also sending its own team of officials to Harrogate. With the latter numbering 4,000 in total, reports from hotels in Harrogate suggest accomodation during the UCI championships will be at a premium. Agents for the various international cycling organisations are already renting out town centre cafes as their unofficial bases for days on end. The chamber president is convinced that, if the town’s residents and businesses throw themselves into it, the rewards will be there. He said: “Are owners and managers of businesses in Harrogate planning to do things differently this year because of the UCI? “Are retailers investing in pop-ups on the Stray during the period of the world cycling championships? “Are the schools planning ahead? Are residents planning a barbeque or street party?